I am extremely late to the party with this one. 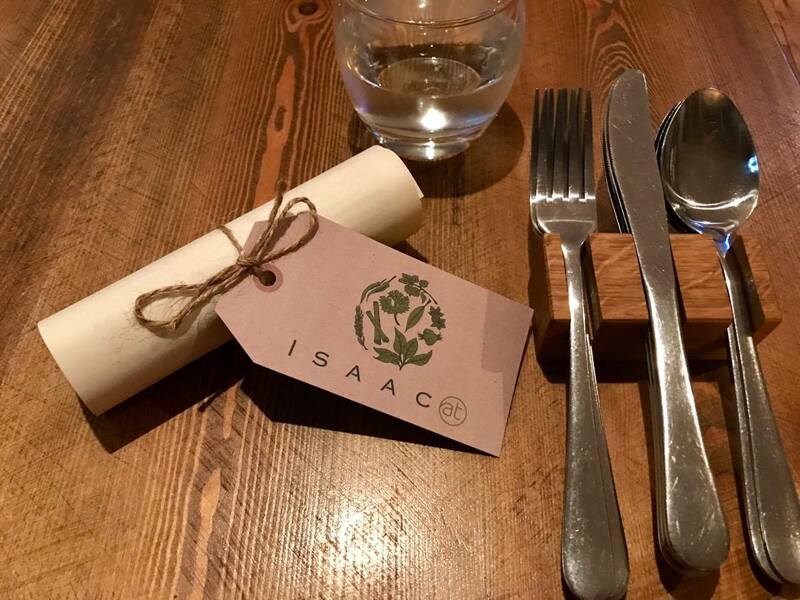 In its second year of trading as a fully fledged restaurant, Isaac At has had glowing reviews from most of the local food bloggers, claimed number 14 at Brighton’s Top 20 Restaurant awards, as well as numerous mentions in national press, most recently, The Telegraph Travel Brighton food guide. I’d been invited* for a meal a couple of times and the dates hadn’t worked out, but after another email from their lovely PR lady and second rave review from my good pal Fran, The Graphic Foodie, followed up with an ‘It’s AMAZING, what are you waiting for, get booked in’, message – I did just that. Tucked away down a side street in North Laine, the 22 seater restaurant underwent refurbishment towards the end of last year, with an extension to the kitchen and a move towards creating a ‘homelier’ feel – the end result being tasteful and stylish, I really liked it. I kind of wish they’d give their name a little face-lift and drop the inexplicable ‘At’. Perhaps it’s a throwback to when they were just a pop up, but they’re all grown up now, and I’ve literally never heard anyone call it anything but Isaac/Isaac’s, and I’m not sure they’re ever going to! 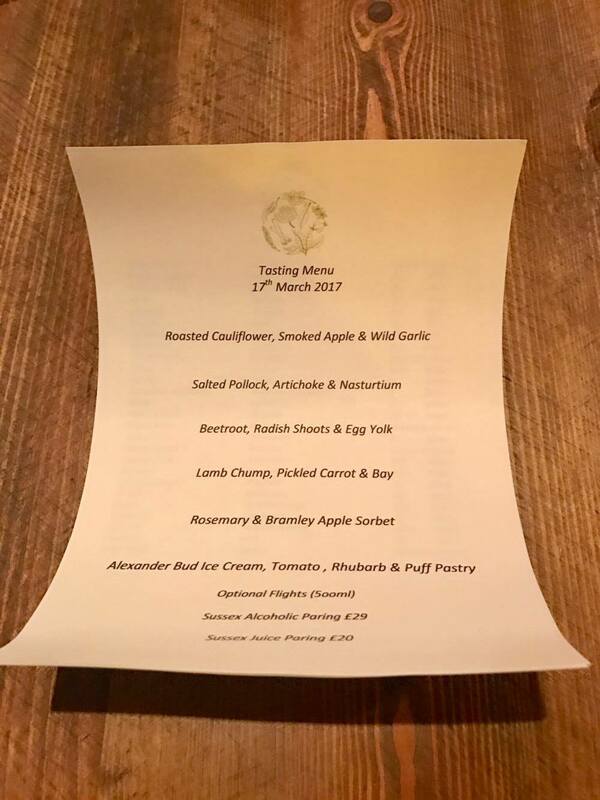 There’s a choice of set or tasting menus (priced at £35 and £50pp respectively) with an additional charge for wine pairing with each course. For the non-drinkers the equivalent, but with juice, is offered, a nice touch and something I’ve only ever seen on the menu at The Pass restaurant, before. 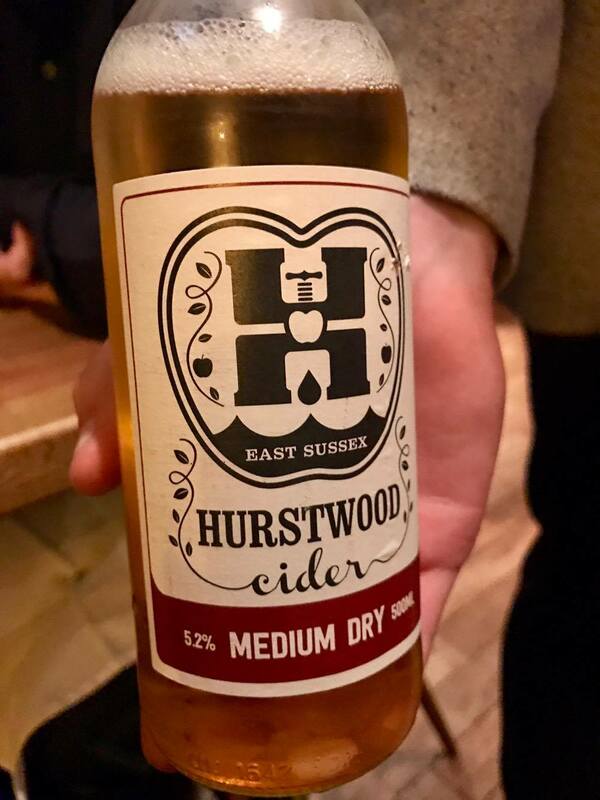 All the food is as locally sourced as possible and the wine and juices are all from within the Sussex borders. From the cutlery holders housing perfectly polished silverware for each course, to the hand-tied scroll containing the menu and list detailing the mileage of all of the ingredients used, the scrupulous attention to detail is clear to see, and what one would expect from somewhere positioning itself as a fine dining establishment. The service throughout the entire meal was incredible, and that comes from extremely judgmental ex waitresses. But a special mention must go to our host for the evening: meet Alex, the sommelier/head waiter formerly of South Lodge, so it goes without saying, his is a polished performance. 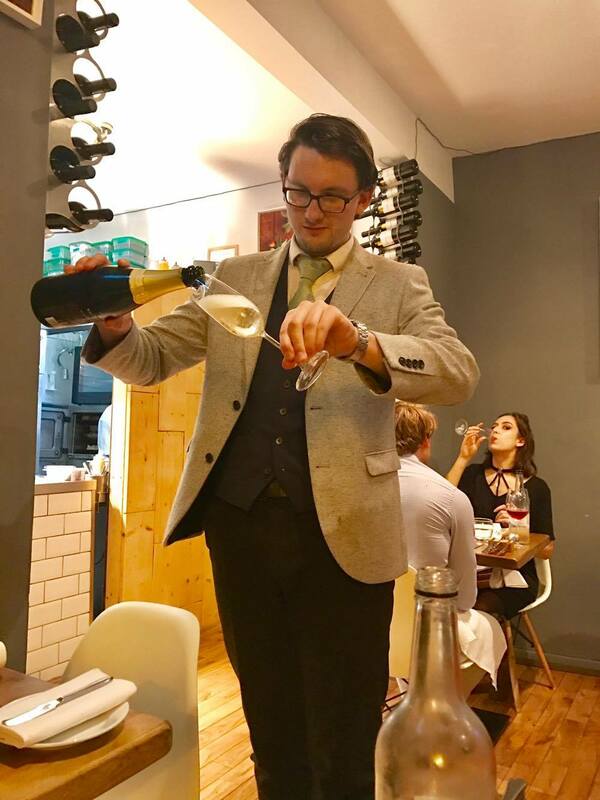 Napkins refolded for us, neither water nor wine glasses ever left empty, every detail of the food and drink explained, and a seemingly encyclopaedic knowledge of English wine* – a bonafide asset to the team and an absolute sweetie. I’m no wine expert. 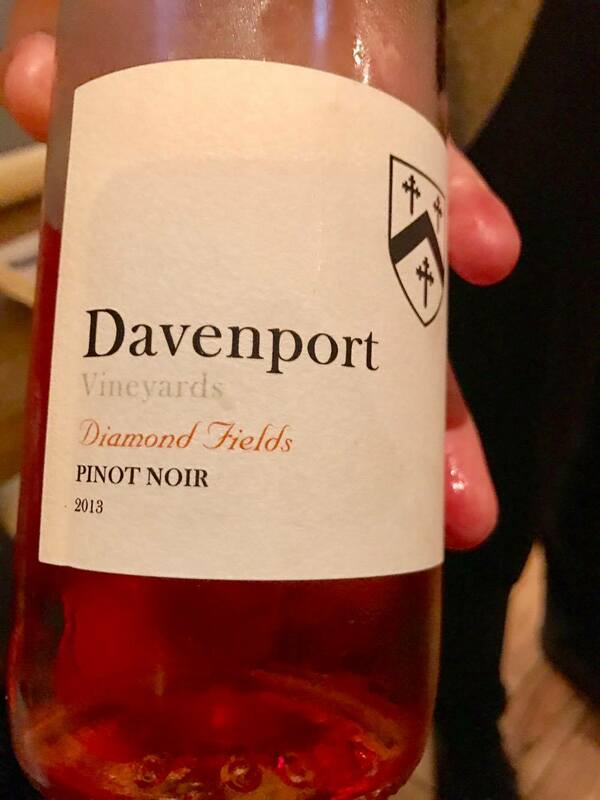 I don’t drink it at home, I don’t order it in restaurants(I think this is the main reason I am not the size of a house), and much to my wine cellar owning parents’ despair, I don’t really enjoy or have much interest in it either. With this in mind there won’t be much, or any, comment throughout re the wine pairing. Just know that I drank every glass that was put in front of me and enjoyed it. 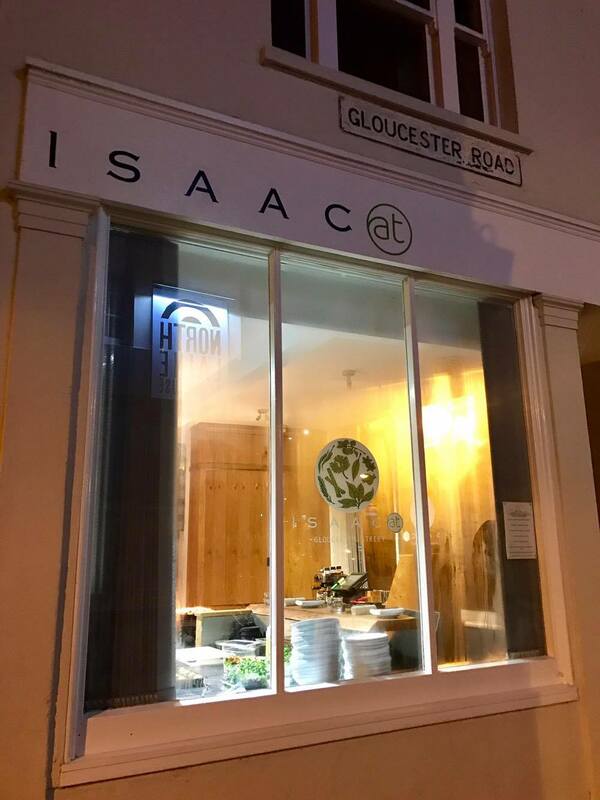 I’d heard great things about the freshly baked bread at Isaac At and as a carb enthusiast (soz, waistline) I’d been really looking forward to it. 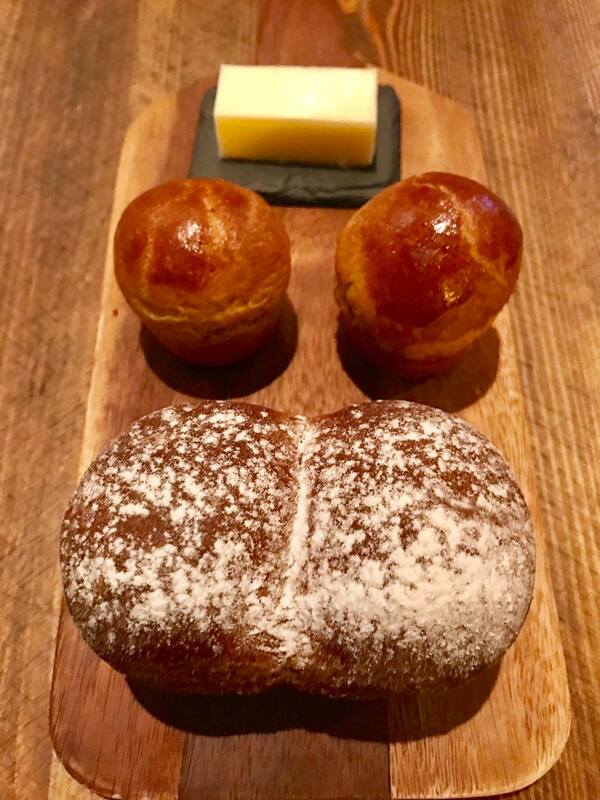 The richly flavoured treacle and stout bread was incredibly moreish, as was the caramelised shallot brioche – which managed to taste both savoury and cake-like at the same time. Finished off with a delicious salted butter, made on the premises, it was the bread board of dreams. The kitchen team, headed up by owner, Isaac Bartland, is a team of lads, all of whose Mother (albeit a gymslip one) I am old enough to be *sob*. My own selfish thoughts on that aside, and without meaning to be patronising, the food coming out of the kitchen doesn’t look as though it was created by people only just out of their teens! Impressive stuff. 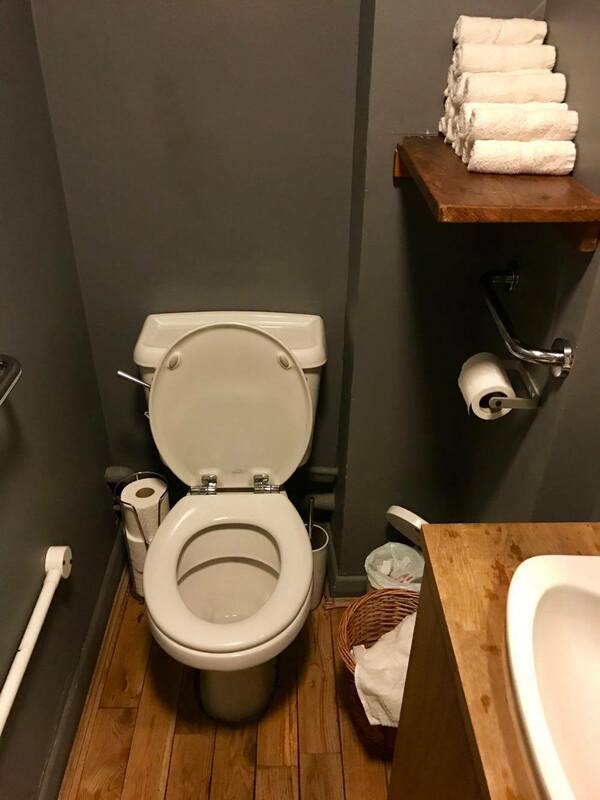 If an estate agent was describing the restaurant, the words ‘compact and bijoux’ would probably be used. 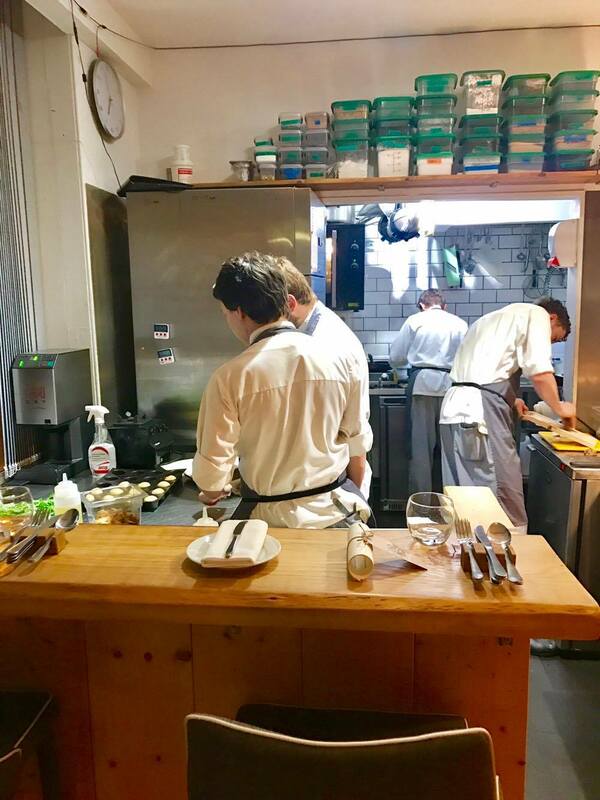 Not content with an entirely open kitchen, they’ve also installed two observation screens – these guys clearly love to be watched, as there’s not a seat in the house which doesn’t have full view of their handiwork – narcissistic or an ‘immersive’ dining experience? It did nothing for me, I ignored it completely, preferring the company of my dinner date, but I imagine others might be enthralled. After setting the bar high with the bread, the pre starter dialled down our enthusiasm a touch. They delivered on their mission statement of ‘big bold flavours’ but sadly, that flavour was burnt cabbage, with not quite enough of everything else to dilute it. The two slivers of scallop were sweet and fresh on their own and we both agreed they would’ve been better off left whole. The dubiously named ‘scurvy grass’ brought nothing to the party at all, getting swallowed up, along with the charcoal mayo, in the dominant taste of singed leaf. The vegetarian course was cauliflower served two ways (roasted and puréed) with a smoked apple sauce, wild garlic and walnut. 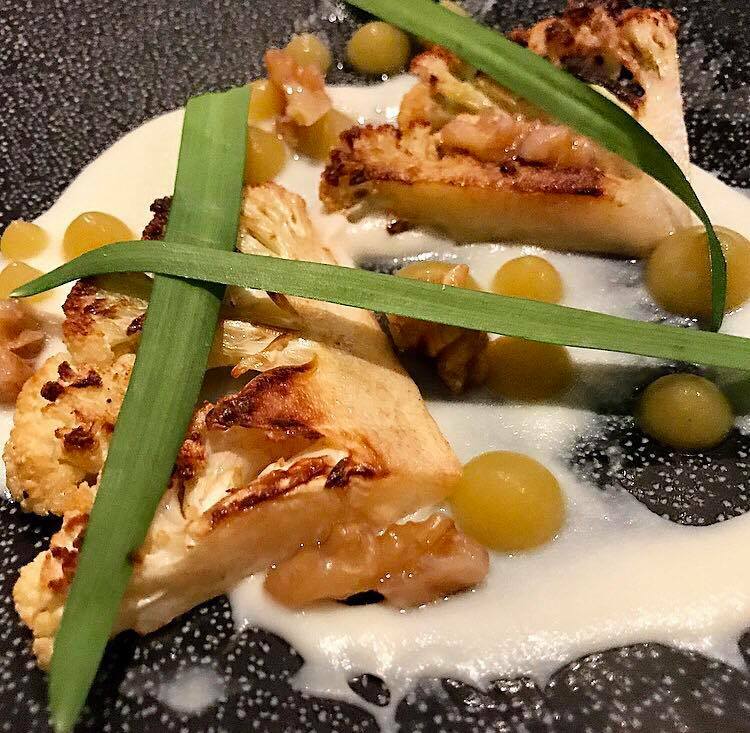 It was a big step up from the pre-starter and we both really enjoyed it, I’ve even replicated the cauliflower aspects at home since my visit. 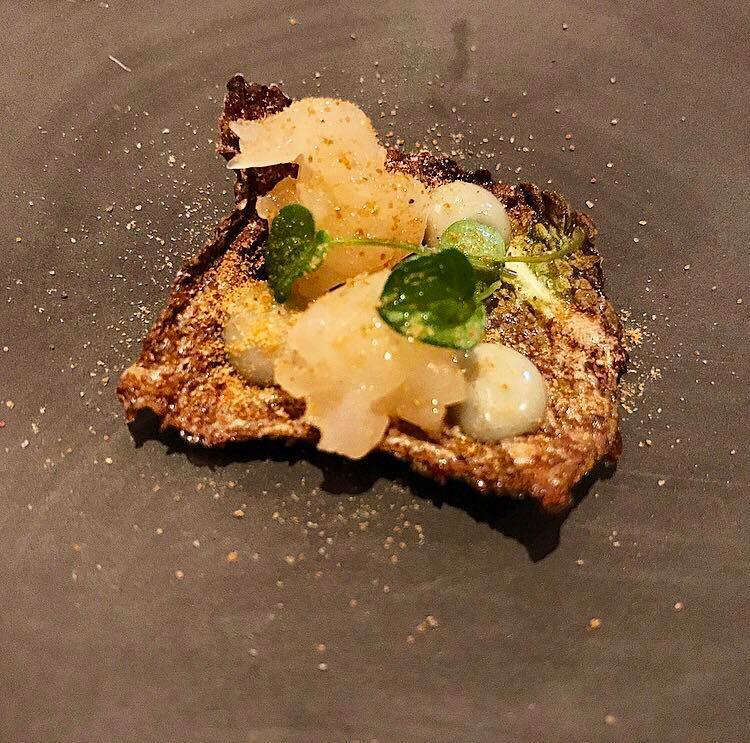 Smoked apple isn’t something I’ve come across before and it ended up being the standout element of this course. Whilst I love a walnut, they didn’t add as much crunch as I’d have liked and I feel as though toasted hazelnuts would’ve packed a bit more punch, both flavour and texture-wise. The fish course was pollock, salted and baked until pleasingly firm then served on a purée of caramelised artichoke. Garnished with raw artichoke, nasturtium leaves and a drizzle of Extra Virgin rapeseed oil, all together the combination of textures was spot on. 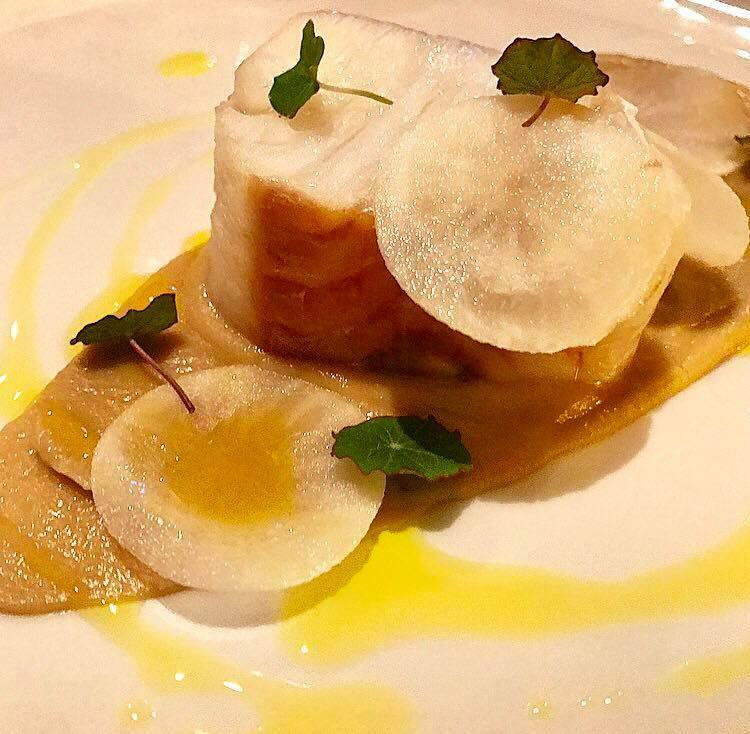 The saltiness of fish was a happy marriage with the sweetness of the artichoke, I don’t often think to order pollock, but this has changed my mind, definitely some of the nicest I’ve eaten. 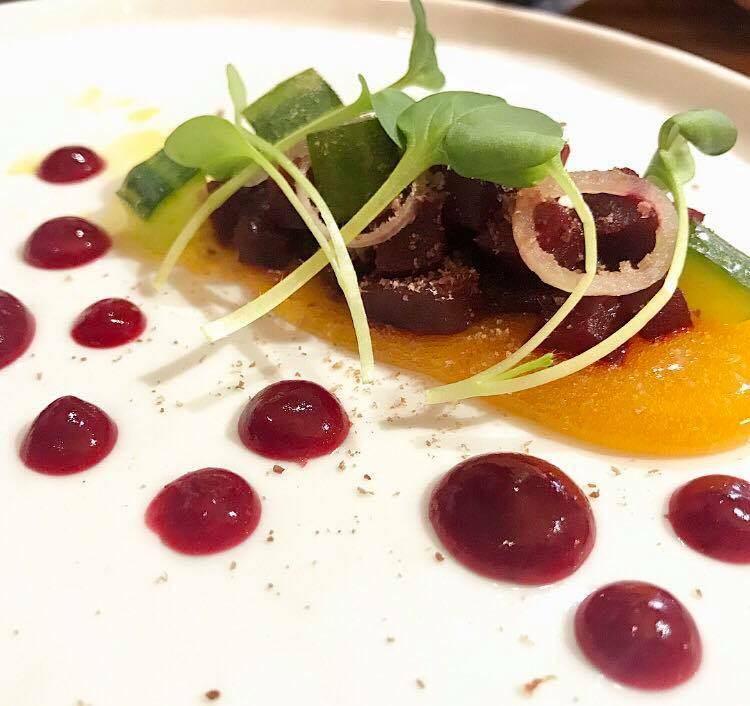 I take every opportunity I can to learn to not despise love beetroot, I’m trying, really I am and hoped that at least one of the two ways (yes, again) it was being served that evening, would be the game-changer. They say you eat with your eyes, and for me, this was the most aesthetically pleasing of all that we were served that evening. The beetroot ‘ketchup’ was my favourite of the two, but the cubed was a stark reminder of why I cannot get behind the flavour of this root veg, that has become by gastronomical nemesis – it tasted like pure earth. The dried venison (in dust form) was pretty much undetectable, but the cured egg yolk, on the other hand, was sensational. Whatever they’d done to it, they need to do again and again and again, bloody hell, so good and worked perfectly with the acidity of the pickled cucumber and peppery heat from the radish shoots too. By this point I would’ve been surprised if the meat course hadn’t been comprised of a smear of sauce, a vegetable served two ways, a drizzle or dots of something and a scattering. 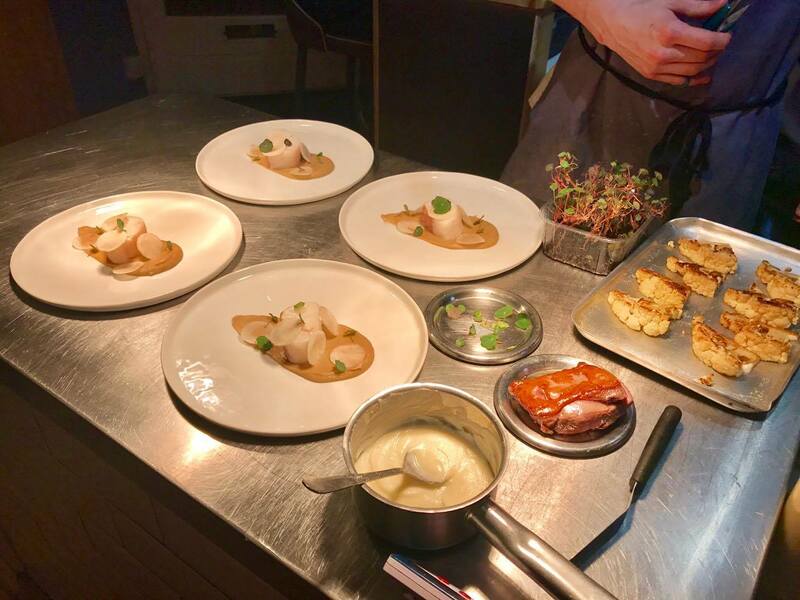 For this tasting menu, at least, there seemed to be a template for each of the savoury dishes – samey in terms of composition, but for the most part, well balanced in terms of flavours and textures. 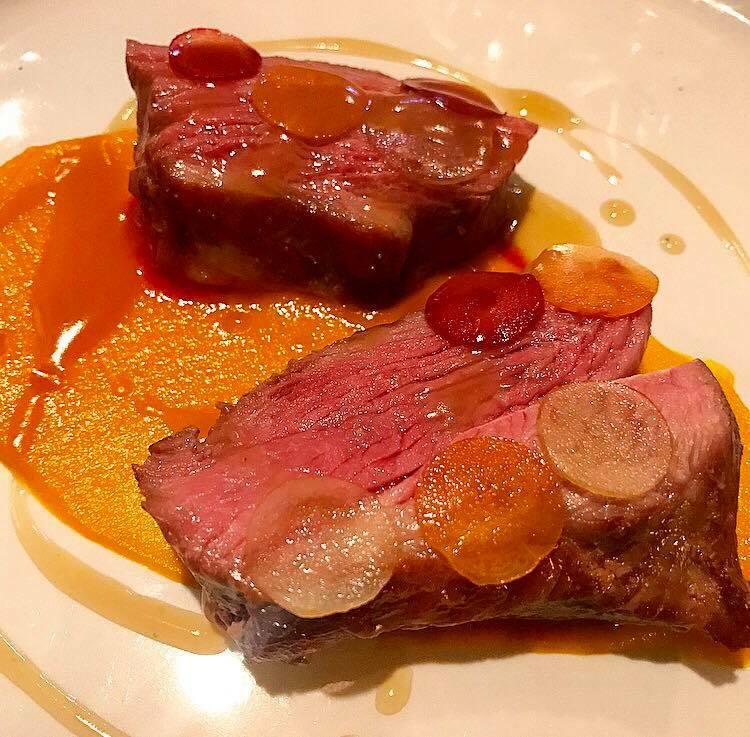 The blushing lamb chump* (could’ve done with a serrated knife to cut it, my only grumble) was served with a duo of carrot, the smoothest of purées and slivers of pickled heritage carrots. The tartness of the latter was required to cut through the richness of the other elements, and did so, with aplomb (I tried really hard to think of a less wanky way of saying this, but failed, sorry). As the menu is a ‘mystery’ format, i.e. 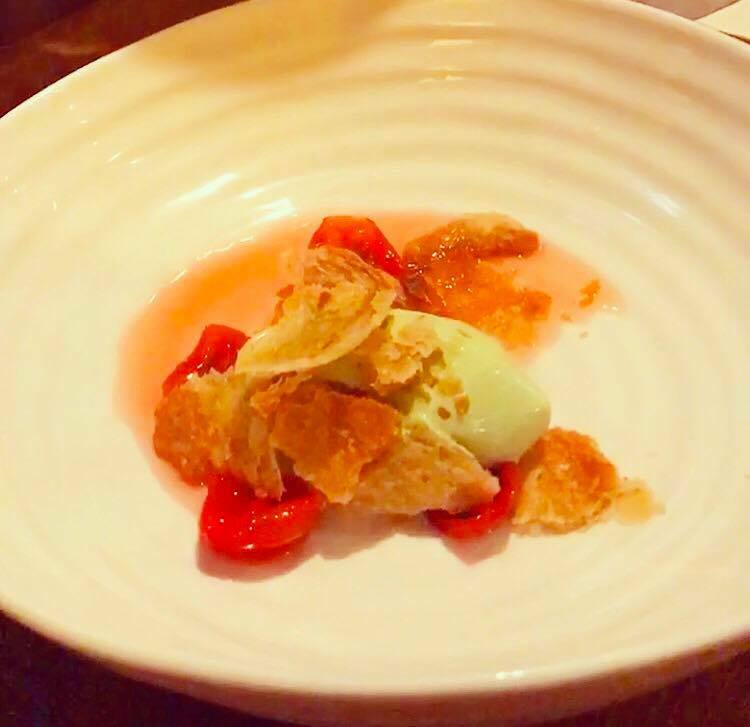 only listing key ingredients with no hint as to how they will be served, the dessert of tomato, rhubarb and pastry could’ve come in any way at all, but turned out to be a deconstructed tart with a rhubarb syrup, poured at the table, by the lovely Alex. I internally did a bit of an eye-roll when the words ‘dehydrated tomato’ were uttered, I was over this food ‘trend’ about a nanosecond after it started. But, in this case, I take it all back, because I LOVED IT. With their moisture removed they were almost glacé cherry like in texture, the tomato flavour concentrated to the point of sweetness, the overall effect being; just wonderful. 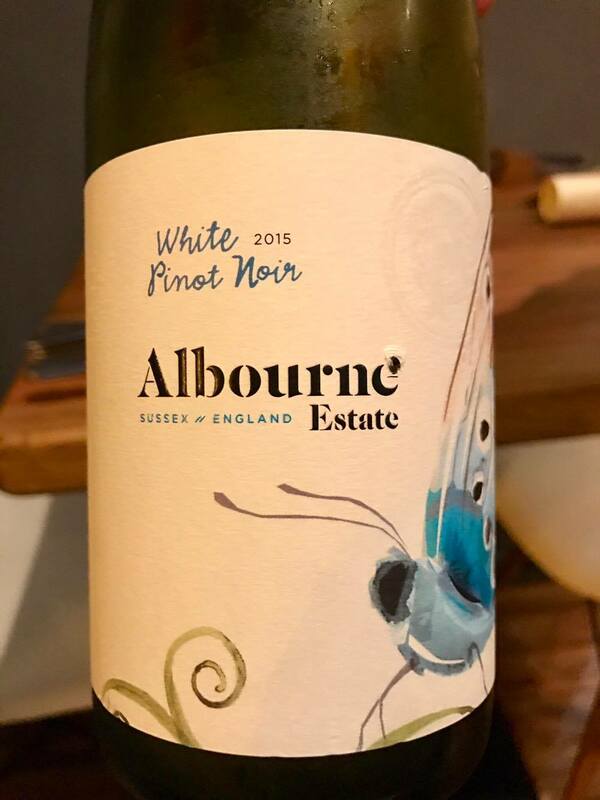 The Alexander bud icecream was described as having a minty flavour, but if it did it was extremely subtle, too subtle for someone at the end of a wine flight to detect, at any rate. I loved the pastry and the rhubarb reduction too, I think I just preferred all of the elements separately than together. 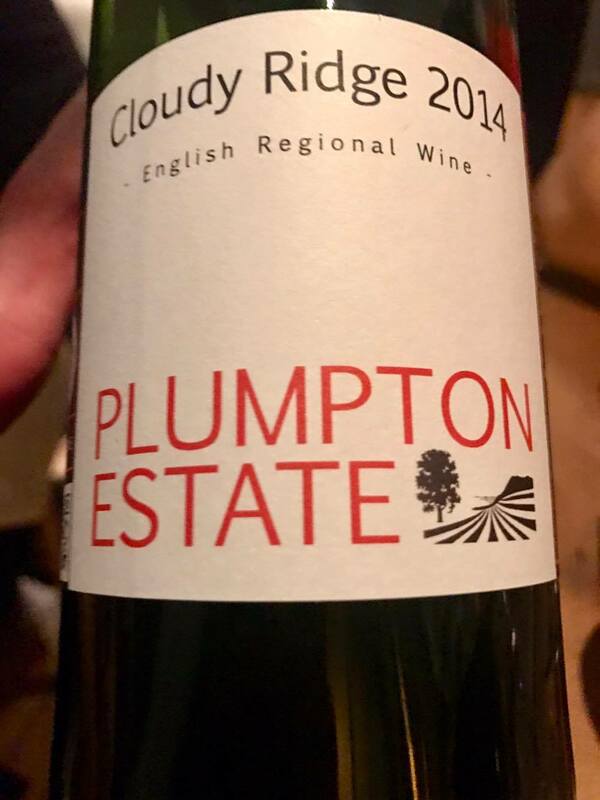 It was served with a local cider, which, although crisp and refreshing, we both wished was a dessert wine – mainly because that’s the only kind of wine I have strong feelings about, but also because the rhubarb syrup was fairly tart, and a sweetness would’ve helped bring it all together. Finishing things off was almond cake with spiced fennel shortbread, I can’t seem to find the picture of it, so just take my word for it when I say; the sponge was perfect, who ever does their baking is some sort of genius. Overall the restaurant experience itself was pretty exceptional. The service is on point and their ethos and commitment to local suppliers and sustainability, laudable. In my opinion it’s definitely deserving of its place in the Top 20 of the city’s best restaurants, but not quite ready for the Top 10. With a few more years experience under their belts, the food could well be as remarkable as the rest. Would I recommend Issac At? Yes, but it wouldn’t be top of my list. Would I go back/be happy to spend the money myself? Prooooobably, but there’s a lot of other places I would rather visit/revisit before I did. Have you been to Isaac At? What were your thoughts? Let me know in the comments section or hit me up on all manner of social networks (links below). I don’t think I would ever eat there, but I do like that bit about the juice option for drinks. 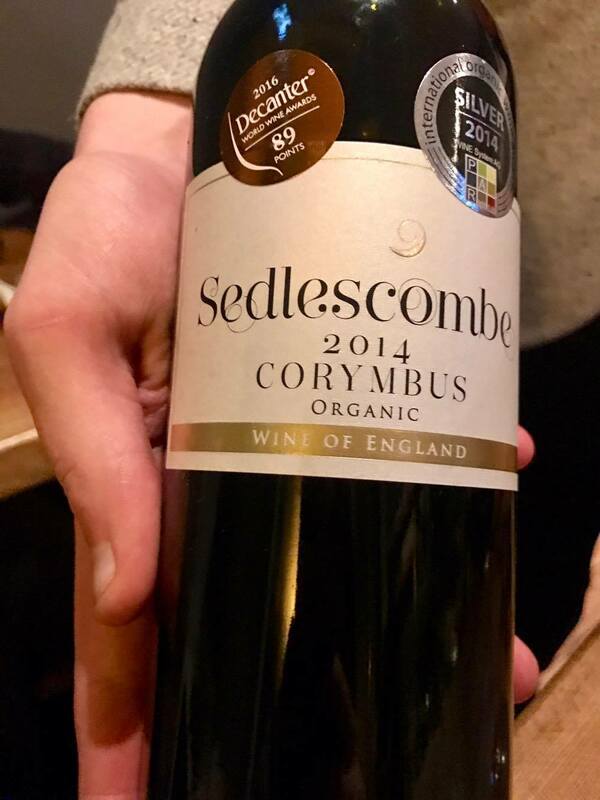 The idea that someone doesn’t want wine seems to be foreign to dining culture — I remember seeing a cookery show discussing the best wines to have with a full English fry up! — and it’s good to see a place breaking away from that. Wines with a fry up!?! I think I’ll stick to my mug of tea or juice (or can of coke if dying of a hangover!). 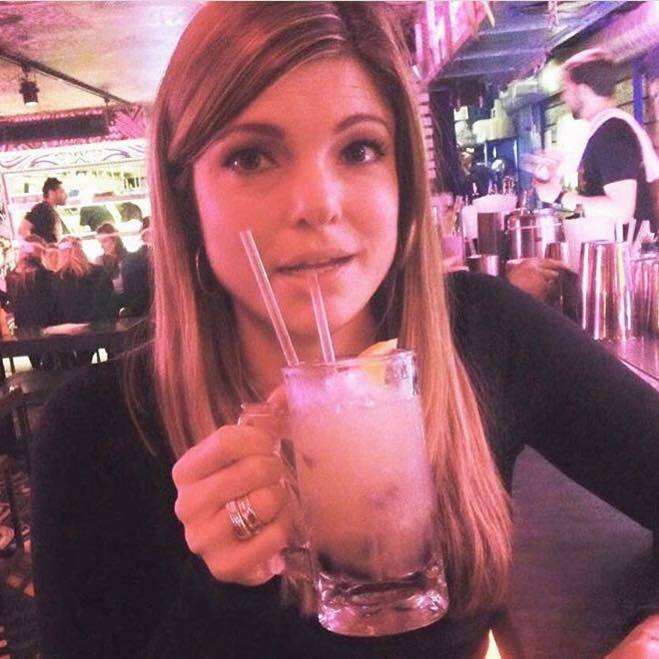 I thought a juice flight was a really interesting concept too- was definitely up for the booze that night though! I would like to personally congratulate you as your Rosie Posie’s Puddings & Pies | Brighton food blog and restaurant reviews has been selected by our panelist as one of the Top 100 Restaurant Blogs on the web. I personally give you a high-five and want to thank you for your contribution to this world. This is the most comprehensive list of Top 100 Restaurant Blogs on the internet and I’m honored to have you as part of this!